Although airlines make a point of stating their hold and hand luggage allowances, we've all got it wrong at some point. For most of us, this involves either putting on several layers of clothing while the rest of the check-in queue tut and roll their eyes at you - OR having to kiss good-bye to half of the contents of your hand luggage at the gate. Basically, anything to avoid having to pay extra to check in another bag. However, if you have the sort of disposable income that the Saudi Royal family does, things are little different. For example, if flying economy means you can only have a maximum of six of your beloved birds of prey in the cabin, but you want to bring all 80 of them with you? Well, you simply upgrade and take them all along for the flight. Yes, here are 80 falcons who are privy to the sort of luxury most of us can only ever dream of. The above (amazing) image was uploaded to Reddit by someone who knew the captain of the Qatar Airways flight. Unlike so many of us, the Saudi Prince had done his research and familiarised himself with the airline's excess baggage policies . 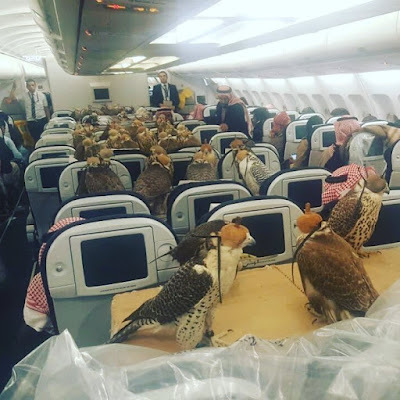 "You are permitted to carry one falcon on board the Economy Class passenger cabin of an aircraft, and a maximum of six falcons are permitted within the Economy Class cabin of an aircraft (country regulations may apply)." Yes, these are hawks, but we're assuming similar restrictions apply.